Mr. Guevara has experience in operations, distribution and sales. As an entrepreneur he has owned manufacturing, plastic injection and HVAC Distribution companies. He joined VR – San Antonio in 2009 and has completed multiple transactions in many industries. 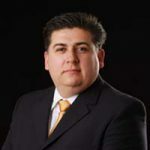 Carlos’ broad career path the ability to work comfortably with a wide variety of business owners as an intermediary and when needed, to assist them in preparing their business to sell. Mr. Guevara is originally from San Luis Potosi, Mexico and has a degree in Industrial Engineering from ITESM (1995).